In an article published in today's issue of 'Nature', a team of researchers from the Advanced Thin Ionization Calorimeter, or ATIC collaboration, have announced the discovery of an unexpected surplus of cosmic ray electrons at very high energy – 300-800 billion electron volts – which must come from a previously unidentified source near the Earth’s solar system. An alternative explanation is that the surplus of high energy electrons might result from the annihilation of very exotic particles put forward to explain dark matter. Over the last several decades, scientists have learned that the kind of material making up the world around us only accounts for about 5% of the mass composition of the universe. Close to 70% of the universe is composed of dark energy – so called because its nature is unknown – which appears to be causing the universe’s expansion to accelerate. The remaining 25% acts gravitationally just like regular matter, but does nothing else so is normally not visible and consequently is referred to as dark matter. However, the trouble with this model is that the ATIC result would require the dark matter annihilation rate to be 200 times larger than that calculated by some theoreticians. “This might be possible if dark matter is found in clumps, and one of these clumps is very close to our solar system", said Prof. Guzik. It may take quite some time before having a full understanding of the nature and origin of these very high energy cosmic rays, but the current result certainly paves the way for a new exciting physics in the 100-500 GeV region of the cosmic-ray spectrum. The 4,300-pound ATIC experiment was designed to be carried to an altitude of about 124,000 feet above Earth in order to study the cosmic rays that would otherwise be absorbed into the atmosphere. The original purpose of ATIC was to investigate where cosmic rays come from and how they are accelerated to such high speeds. ATIC is an international collaboration of researchers from LSU, University of Maryland, Marshall Space Flight Center, Pruple Mountain Observatory in China, Moscow State University in Russia and Max-Planck Institute for Solar System Research in German. 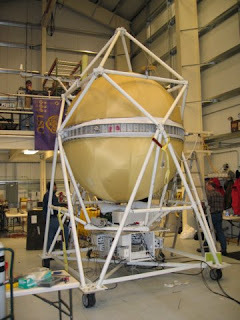 ATIC is supported in the United States by NASA and flights are conducted under the auspices of the Balloon Program Office at Wallops Flight Facility by the staff of the Columbia Scientific Balloon Facility. "An excess of cosmic ray electrons at energies of 300–800 GeV"
Nature 456, 362-365 (20 November 2008), Abstract.